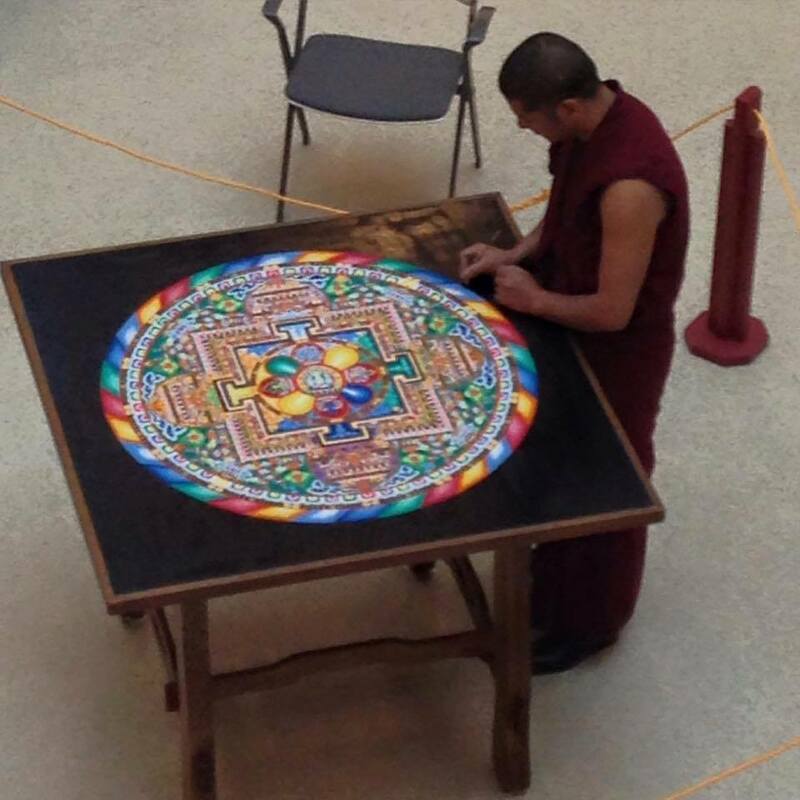 Addlestone Library will be hosting the Charleston Tibetan Society as they construct a sand mandala, an ancient, sacred form of Tibetan Buddhist art, in the Addlestone Library rotunda. Venerable Lobsang Tsering from the Drepung Loseling Monastery Center for Tibetan Buddhist Studies, Practice, and Culture in Atlanta, Georgia, will be constructing a mandala devoted to Chenrezig, the Tibetan name for Avalokiteshvara, the Bodhisattva of Compassion. This particular mandala illustrates, in two dimensions, the divine palace, residence, or celestial abode of Chenrezig. The finished mandala will be approximately four feet in diameter and will take a week or so to complete. There are several events associated with the sand mandala. Venerable Lobsang Tsering and Geshe Dakpa Topgyal, Spiritual Director of the Charleston Tibetan Society, will perform the Chenrezig Sadhana meditative practice including the recitation of the Chenrezig mantra. During the closing ceremony there will be a 20 minute power point presentation about the mandala. Afterwards there will be chanting and the mandala will be dismantled by being swept up (symbolizing he impermanence of all phenomena) and distributed to anyone who would like to take some, and the rest being dispersed in the nearest body of water.